ECOSHELTA has long been part of the sustainable building revolution and makes high quality architect designed, environmentally minimal impact, prefabricated, modular buildings, using latest technologies. 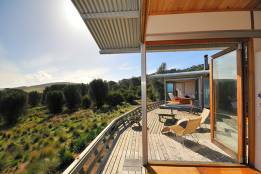 Our state of the art building system has been used for cabins, houses, studios, eco-tourism accommodation and villages. We make beautiful spaces, the applications are endless, the potential exciting. Ecoshelta has been developing and deploying pre-fabricated modular building systems since last century. We are the forefront of the practical implement­ation of new technological developments across the many fields of construction, we use state of the art alloy frames, structural insulating panel systems, responsibly sourced timber, plantation bamboo and E0 plywood systems. 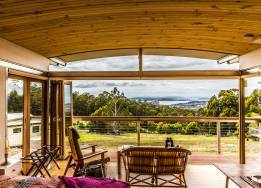 The Ecoshelta system has been designed and developed over the last three decades by Stephen Sainsbury Architect, an award winning environ­mentally responsible architect­ural practice. We specialise in environ­mentally and eco­logically sound, beautiful places to shelter, undertaking the building process in the belief that environ­mentally aware buildings can be luxurious, inspiring and beautiful places to live, work and play. Ecologically sensitive buildings will come to symbolise a more mature, environmentally aware culture. We are willing to go the extra distance to ensure that our buildings are as eco­logically accountable as we can achieve. Each Ecoshelta pod has a fully modular frame and SIPS panel based floor, wall and roofing systems that allow for a wide range of choice in roof forms, room layouts, wall door and window positions and room fit-outs. The frame is tough, robust, strong and resilient. Ecoshelta e.pods and smaller tough.pods (t.pods) can be built anywhere, responding responsibly to the place and owner’s require­ments. The single tough pod and e.pod cabin is a rapid deployment simple building and we can have one on a site in a matter of days. 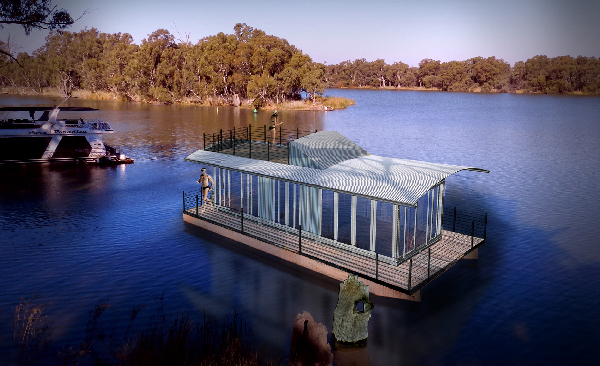 Ecoshelta's latest design option is the Small Pod, based on a 3.6m x 3.6m base pod with 1.2m side extensions for kitchen and bathroom and a verandah deck wrapping around, and a total internal area of 20 square metres. The t.pod House Boat is an excellent option for site offices, recreational pontoons, minimal noise impact & low/no wash research platforms. The single e.pod studio cabin with ensuite side extension has been developed for use as a backyard urban studio, a home office, remote area cabins and eco-tourism acco­mmodation. 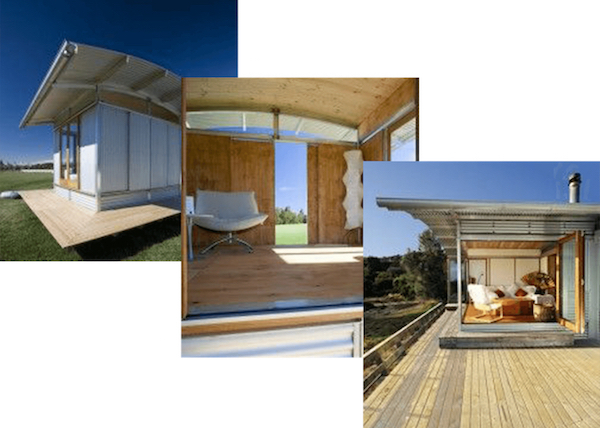 The two e.pod with two side extension cabin is suitable for backyard compliant granny flats, remote area cabins and ecotoursim acco­mmodation. The three e.pod with two side extension house can incorporate a 2 bedroom house with bathroom and combined living-dining. The 6 e.pod and side extension house can incorporate a 3 bedroom house bathroom, combined living-dining and lounge room. 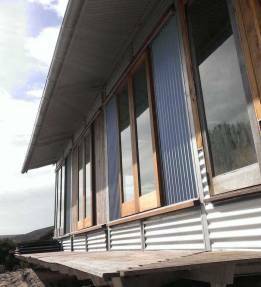 Made from space-age alloy, our prefab tough pods and e.pods can be easily transported and erected anywhere, in as little as a day, for an oceanfront retreat, eco-tourism accommodation, studio or any number can be joined together in limitless designs to make delightful, luxurious homes. 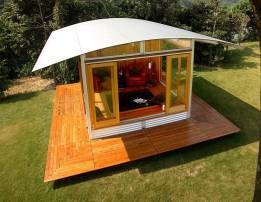 Our two pod cabin complies with state 'Granny Flat' legislation for simple approval processes. 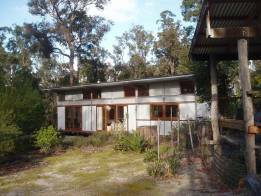 Can an Ecoshelta design include bathrooms and kitchens? We have options available for fully fitted ensuite bathroom extensions, bathhouse fitouts, kitchens and laundries to your specifications. As well, we can supply to ‘Lock Up’, ... Read More.